Welcome to the events page of Kerala Club California. On this page you will find links to pictures, videos, and news about all the events we have organized so far. Links to those we are planning may also be found. We appreciate the continued support and encouragement from the Malayalee community in ensuring the success of each of our events. Your constructive feedback is essential, and we love hearing from you. Please email us at info@keralaclubca.org with your suggestions, comments, questions and encouragement! Thanks! 07/11 Sevathon: Fund raiser for Jeena and families of children with development disabilities. KCCA at Independence Day Parade| Slideshow:Kerala Club wins 1st prize - Best Appearance! 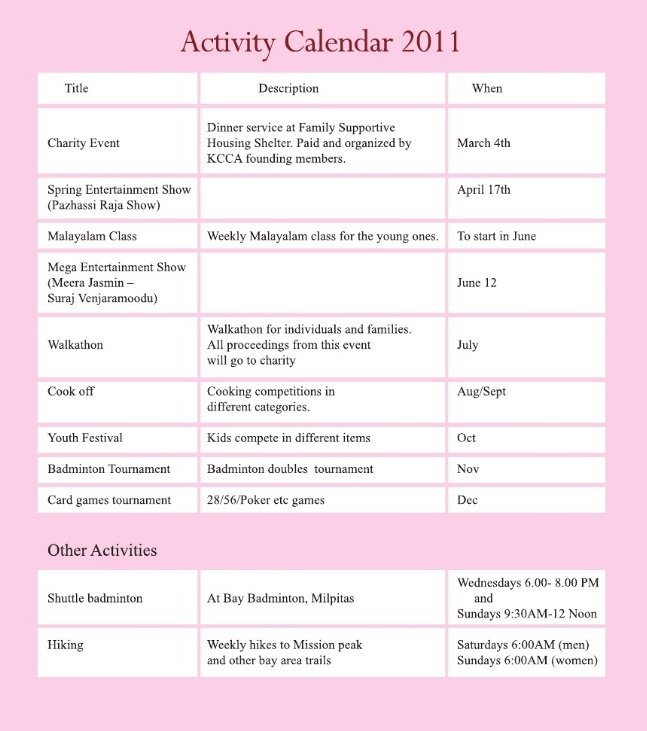 This is the Kerala Club activity calendar published in the KCCA Year Book 2011. Please note this shows a tentative schedule, and the club reserves the right to cancel or reschedule activities to earlier or later dates.